Spend a day with your class in Ohiopyle exploring the beautiful Ohiopyle State Park and enjoy all the wonderful activities offered! Laurel Highlands Outdoor Center and River Tours offers some great activities for school field trips. Whitewater rafting on the Lower Yough is really popular with middle and high school aged kids. The Class III rapids are exciting without being too overwhelming. The Middle Yough’s calm and scenic Class I and II rapids are popular with elementary school kids. And they love keeping an eye out for otters or bald eagles! 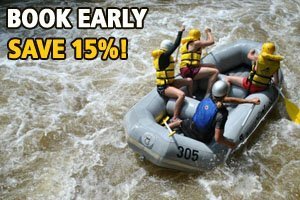 We offer 20% discount off rafting for all school groups. We also offer fun zip-line field trips! Ohiopyle Zip-line Adventure Park provides high-flying fun for everyone! The Ohiopyle Zip-line Adventure Park features two levels allowing children as young as four to take part in this activity. The Ohiopyle Zip-line Adventure Park can help boost students’ self-confidence and balance. We use a Safe-Roller system so once you are clipped in, you are attached by a tether to the course at all times. At the Old Mill General Store, you can treasure mine at Ohiopyle Mining Company. This activity is great field trip for school groups as miners learn how to pan for their treasures, identify what they find, and take home a nice collection. Entertaining and educational, treasure mining is fun for all ages! It’s like panning for gold! Choose from several different field trip packages that include biking, treasure mining, and zip-lining. ← Pre-back to School Family Fun in Ohiopyle!